Aphria, one of the biggest pot companies in Canada, had its shares drop as much as 30 per cent on Monday following the release of a short-seller’s report that described the company as a “black hole”. The report - co-authored by Quintessential Capital Management and Hindenburg Research, which are both shorting Aphria’s shares (APHA.TO) – was slammed by the pot producer as “false and defamatory”. The company added that it is pursuing “all available legal options” against Quintessential. 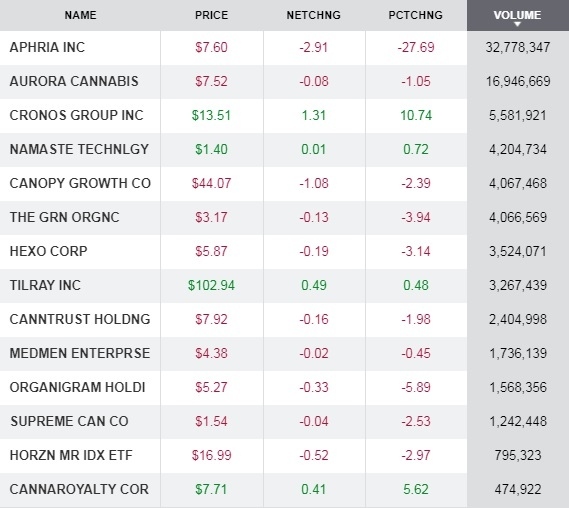 Meanwhile, Cronos Group shares soared as much as 30 per cent following a Reuters report that said the pot producer had engaged in talks with tobacco giant Altria, citing people familiar with the matter. Cronos (CRON.TO) officials said they do not comment on market rumours. Altria has also been linked with Aphria and Tilray, as well, according to the Financial Times. The tobacco maker said in September it was exploring its options on cannabis but would follow U.S. federal law, under which the drug remains illegal. Will Ontario’s cannabis market ultimately be ruled by Big Bud? The province’s cannabis retail aspirations were released last month and placed a hard cap on the number of stores that can be owned and operated by a single person or company at 75. But there might be an opportunity for some major pot producers to have a retail footprint through franchises, according to one lawyer who has studied the regulations. That means that with the proper ownership structure, companies such as Canopy Growth and its Tweed brand could, for example, license their name and its branded product through storefront operations, exceeding the cap. One of the main reasons that U.S. states such as Michigan and New Jersey have warmed up to legal cannabis is the expected increase in tax revenue generated from sales of the legal drug. But the states, which have some of the lowest tax rates in the U.S., could actually charge more taxes for their legal pot than originally intended, some observers say. Recreational marijuana sales in Michigan are expected to rake in US$89 million in tax revenue for the fiscal year beginning next October, while New Jersey estimates that legal pot would bring in US$60 million in tax revenue before June 30, 2019. Need a job? Try the cannabis industry, where eight of Canada’s largest cannabis companies are now actively recruiting for approximately 1,700 positions, according to Bloomberg. Many companies, including Canopy Growth (WEED.TO) – which is hiring 1,200 alone – as well as Aphria and Aurora Cannabis (ACB.TO) say they expect that number to grow as they expand production facilities after Canada legalized recreational marijuana in October. BMO Capital Markets estimated that industry employment was around 3,500 people when legalization took effect in mid-October.